We all know the importance and beauty that natural light can bring to a home, yet it takes a certain amount of skill and creativity to design a layout that invites sunshine in. 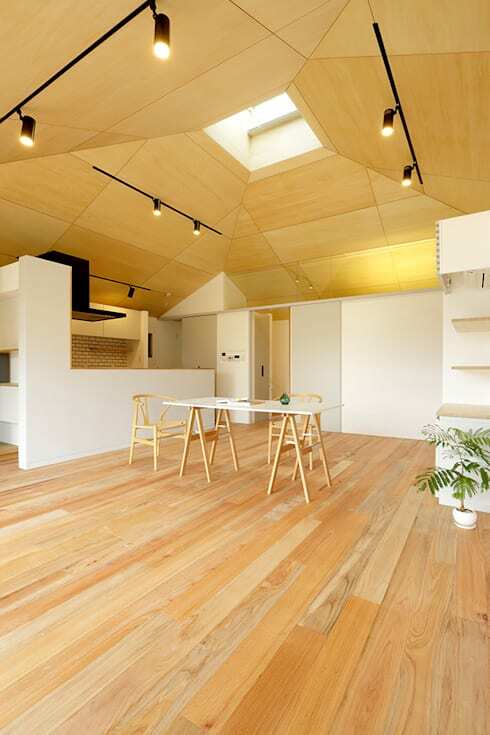 Japan’s architectural firm Miyuki Design, located in Gifu, is one of those rare geniuses that can play with sunshine. Today’s homify 360° discovery highlights one of their creations – a home with a spacious, minimalist floor plan that is treated to a skylight perched upon the apex of the roof, which causes a generous flow of natural glow to stream into the rooms below. But of course one requires more than sunshine to present a cosy and beautiful space: clever-designed features aid in today’s architectural discovery, such as large sliding doors, décor made from pale wood and white walls, and an underlying minimalist design that focuses rather on the presence of space than on design pieces. Let’s discover the interior sunshine home. 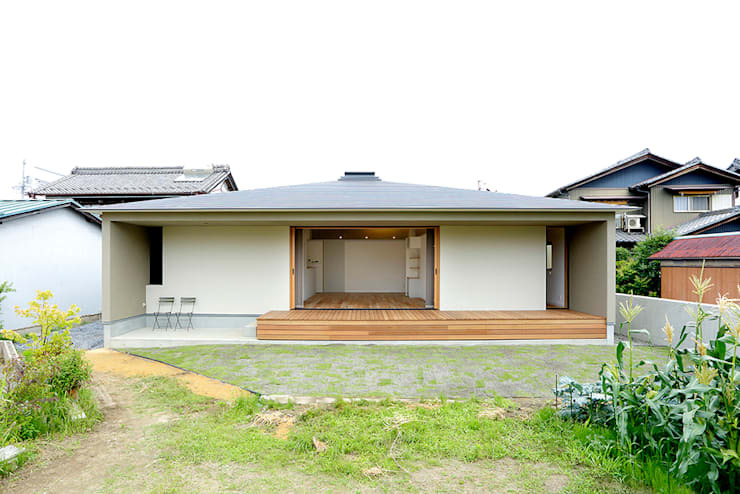 The exterior of the house appears very minimalistic and streamlined, sitting quite humbly in-between the taller houses of the neighbourhood. The roof slopes ever so slightly upwards, creating a high hotspot for that central skylight. Even though cool neutrals dominate the facade, the colours are warmed by the wooden panels used for the house’s porch, as well as the interior floorboards. With the home’s interior space being quite minimalistic and serene, it serves as a clever contrast to the exterior garden’s lush and busy layout. We’ve crossed the threshold and are delighted to see the classic combination of white and wooden décor bathed in a splendid array of fresh sunshine, thanks to that gorgeous skylight in the ceiling. See how those large wooden panels lining the ceiling create a lofty feel for the home, contrasted by the sleek black of the spotlighting in terms of both colour and material. In keeping with the facade of the home, the furnishings are very minimalistic: simple chairs and a foldable table provide functionality and match quite well with the white and wooden décor. Resting in an alcove of white and wood is the kitchen – a simple space that is also decidedly modern. Black metal and gleaming silver are added to the culinary space’s palette, creating a bit of bold character. The wall right opposite the kitchen area has been treated to a range of built-in storage spaces, with shelves and a small cabinet providing a nesting place for clutter. This effectively allows the minimalistic, expansive atmosphere within the house to continue with its calm, free-flowing vibe. From this view, we really get a sense of how spacious and streamlined the interiors are. 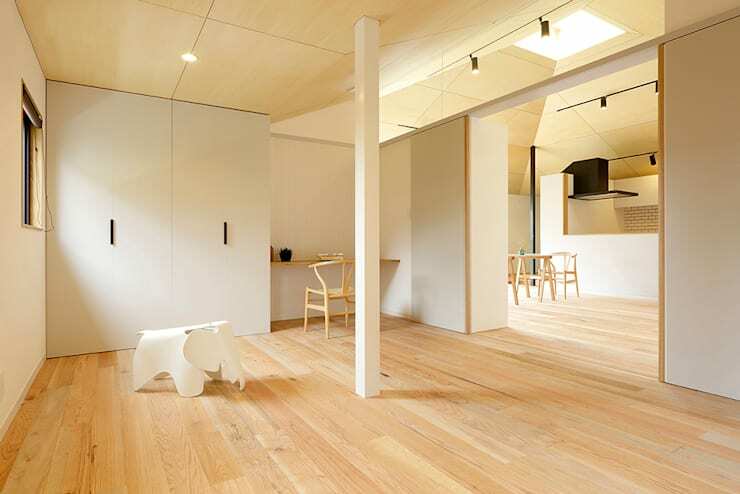 The flowing lines of the pale timber floorboards help to elongate the living area, laying down a subtle path to those generous sliding doors that lead to the garden. 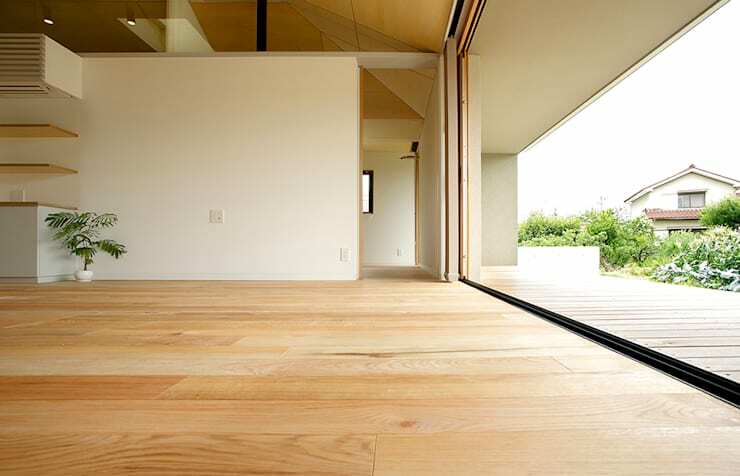 These fantastic doors completely transform the interiors, inviting fresh air, scenic views, and clear light inside. 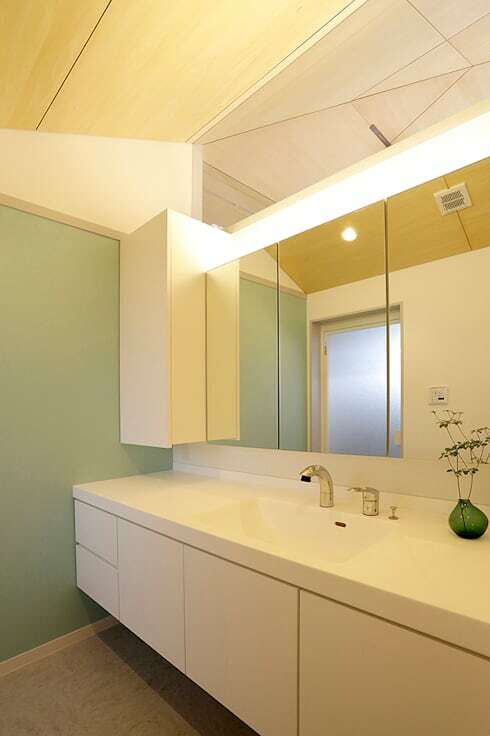 We locate the bathroom, which is very reminiscent of a tranquil spa space. White and wooden surfaces are still present, yet here they are joined by serene touches of mint green tones and pebble grey floors. Thanks to the wall mirrors, a fantastic sense of depth and space is created in the bathroom, allowing the incoming natural light to delightfully dance and bounce about. Adjacent to the living area is the bedroom, which seems quite spacious thanks to its clever layout and minimal use of design pieces. 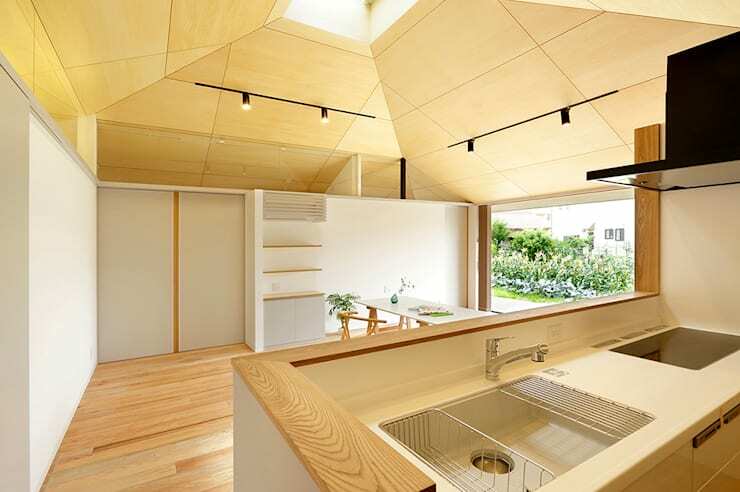 As an additional ingenious touch, the home’s ceiling has been designed to slant upwards before the bedroom ends, departing from the wall and inviting sunlight to stream into the bedroom from the home's central skylight. For functionality, twin built-in closets and a simple wooden desk were added. Want to know more about the minimalist design? Then see: Keep it sleek, chic and minimal.